Sora Gag is a perfect for pictorial related blogs and websites. It is having a awesome color scheme which is perfect for showcases memes and pictures and videos. We are sure after applying on blogger you would never turn back to your old template. 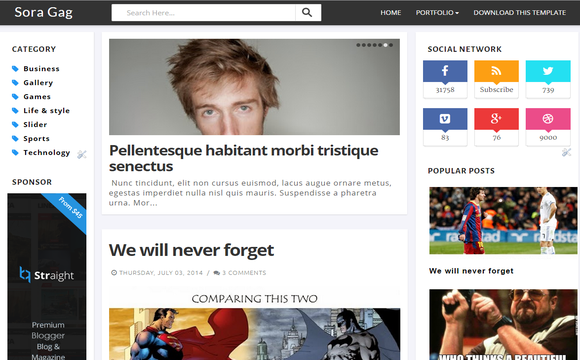 Sora Gag blogger template is extremely lightweight, fast loaded, ajaxified and 100% social friendly. Elegant share buttons and meme search with embedded easy editable code makes it extremely easy for a beginner to customize the theme.